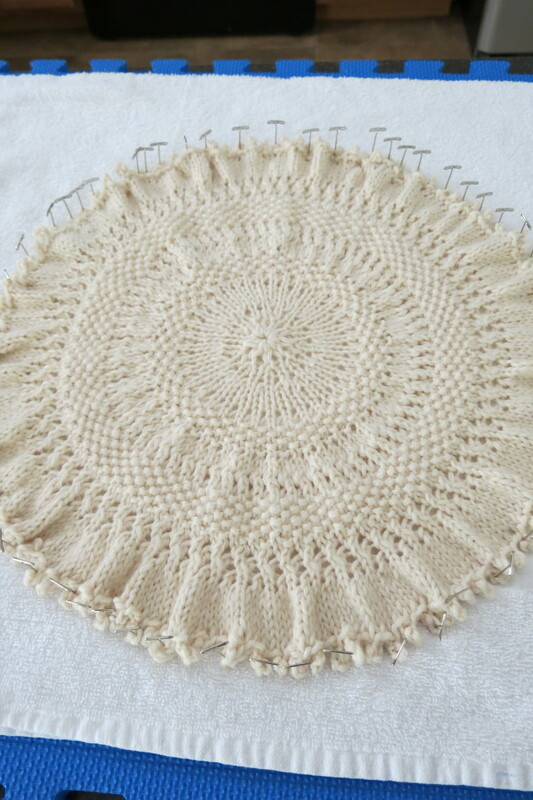 This circular knitting pattern makes a charming tree skirt or doily to accessorize a miniature or table-top Christmas tree. 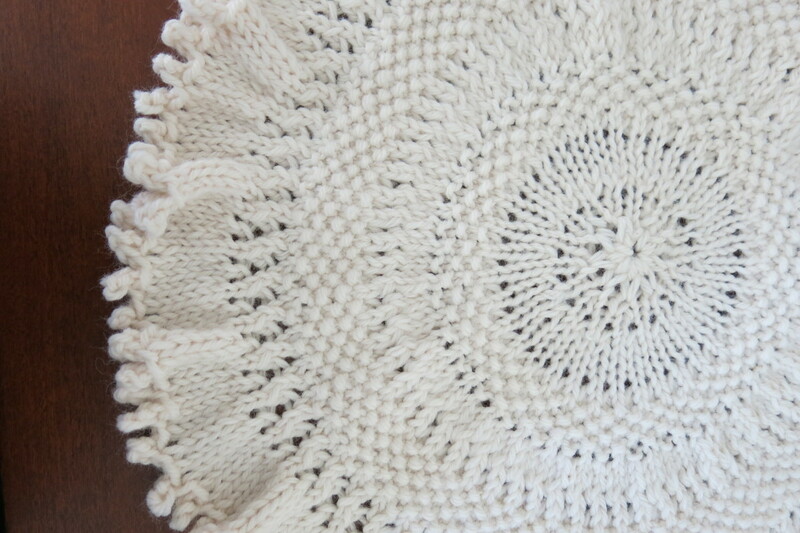 Although designed as a Christmas tree skirt, you could also use this pattern to knit a round doily to put under a decorative bowl or lamp. My in-laws recently gave me a small ceramic Christmas tree. I was especially thrilled to receive this gift because it was actually made by my husband's grandmother over fifty years ago. 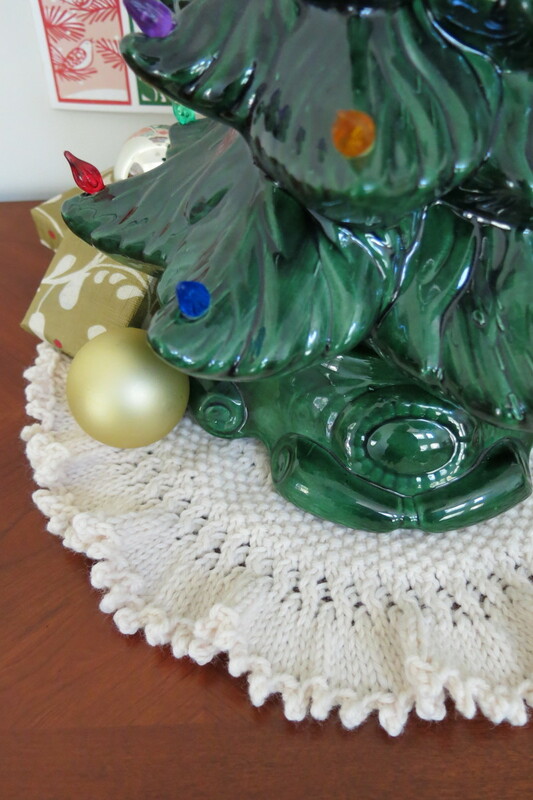 I was less thrilled, however, with the possibility of this ceramic tree scratching the surface of my console table while out on display, so I designed this Christmas tree skirt knitting pattern to create a round doily for under it. This skirt or doily features bands of different stitch patterns and can be adjusted in size depending on your needs. 1. 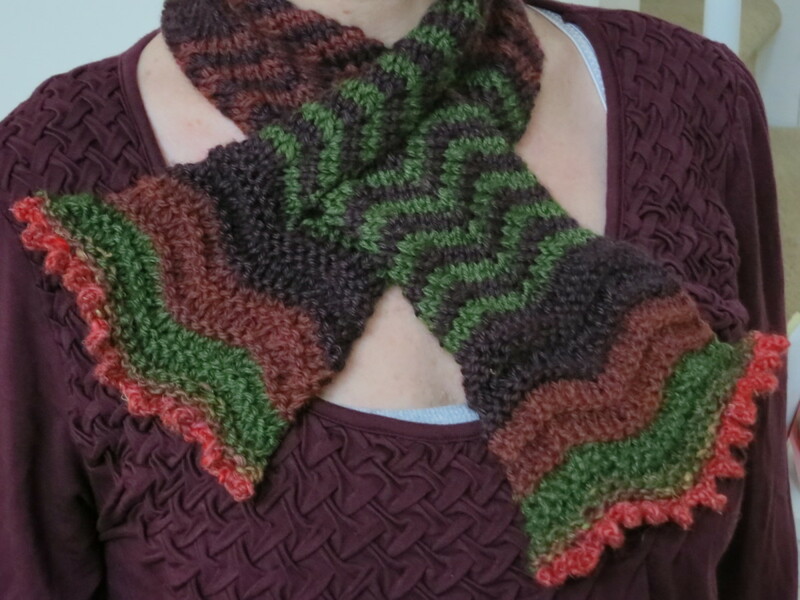 You can knit each band of this pattern in a different color, alternating between red, green, and white as you choose. 2. You could knit this pattern in a yarn that has a thread of gold or silver that runs through it. This is a great way to add some holiday sparkle to your tree skirt. 3, This pattern would look really pretty knit in a yarn that has sequins or beads running through it. 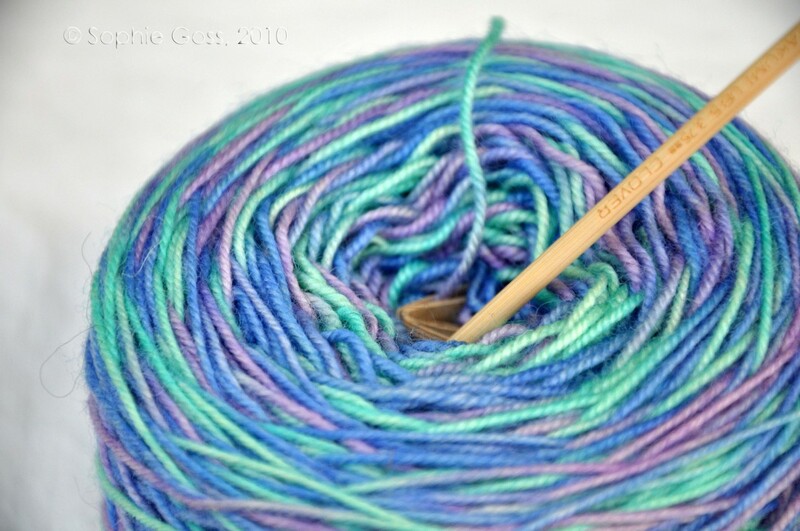 I've never knit with one of these yarns, but this pattern would be perfect for it! Gauge = 17 stitches x 24 rows in Stst = 4 inches, gauge is not terribly important in this project, but will change the overall size of your finished Christmas Tree skirt. Adjust your needle size as needed. This knitting pattern is completely adjustable. You can stop knitting at any time and bind off to create the size of tree skirt that you need. 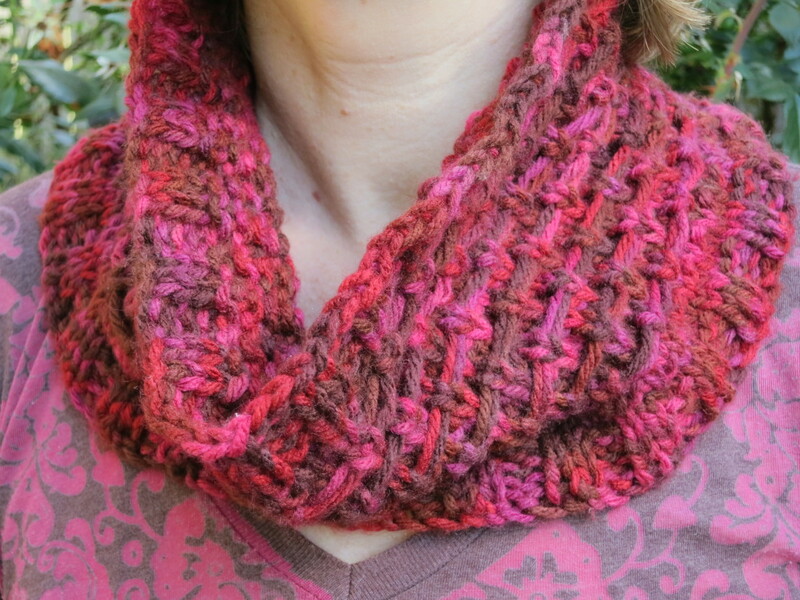 The picot edging is totally optional. If you don't like one stitch pattern in the bands of this skirt, you can replace it with another. 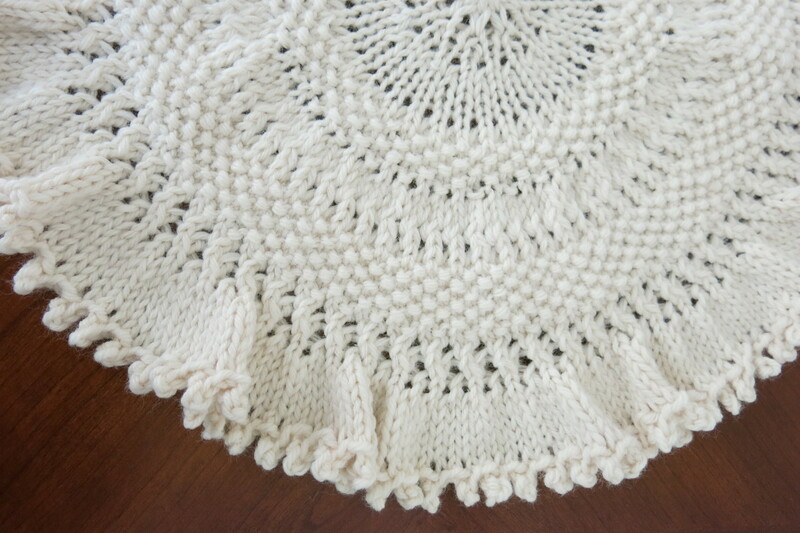 You can completely alter this pattern to make the tree skirt or doily you want. To Begin, cast on 9 stitches using Emily Ocker's circular cast on. You will need a crochet hook for this cast on. I used a size H crochet hook, but the size is not essential. I only have one crochet hook and use it whenever I do this cast on, regardless of the weight of yarn I'm using. Move your cast on stitches to three dpns, place marker, and join in the round to begin knitting. As you continue to work this piece and your skirt becomes larger, you can add another dpn when you need it. As some point, move your stitches to a circular needle to accommodate the size of your skirt or doily. Round 1: Knit all 9 stitches, as you begin working your stitches, pull on the end of your yarn to tighten the hole in the center of your cast on. After you've worked a few rows, you may want to weave in this end to keep your center point snug. Bind off or begin picot edging. Cast on 2 additional sts at the beginning of the round. Then bind off 4 sts (this includes the 2 sts you just cast on). Slip the resulting st on your right hand needle back to the left needle. Cast on another 2 sts and continue the process of binding off 4 sts and moving your stitch back to the left needle. Do this until all your stitches have been bound off. Weave in your ends. I would suggest pinning your skirt or doily down dry, then spraying it with water to block. To pin this piece for blocking, I put a few pins in at where 12 o'clock would be, then moved to 6 o'clock, pulling my piece flat on my blocking pad. Then I put a few pins in at 9 o'clock and at 3 o'clock. Once I had these spots secure, I filled in between my clock positions, placing a few pins in at a time, then moving to another area. I left the edge in a ruffle, but I made sure the center area was flat. Then I sprayed the whole piece with cool water and let dry completely. 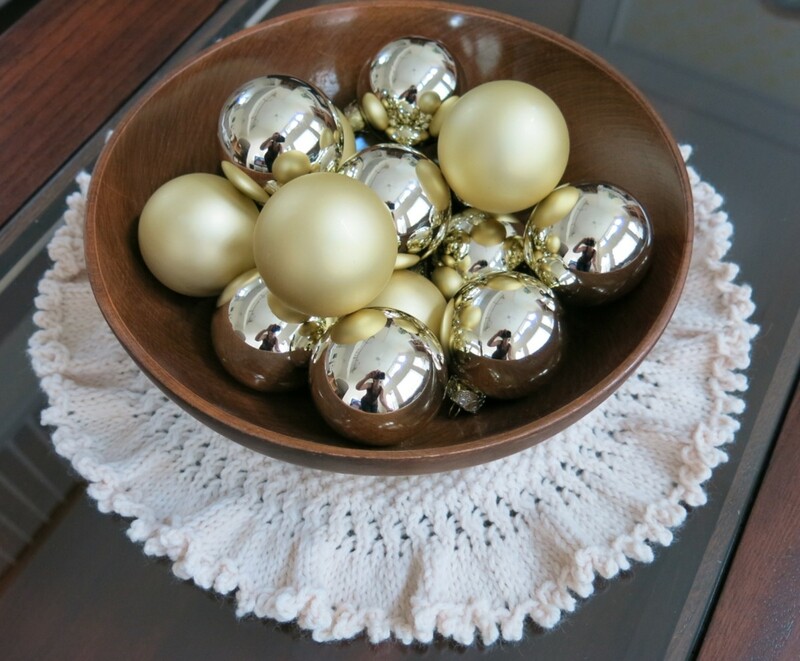 You can use your tree skirt throughout the year as a pretty doily under a bowl, lamp or other decorative item. You can sew on buttons around the outside seed stitch band to add additional detail or tailor this doily for other holidays. 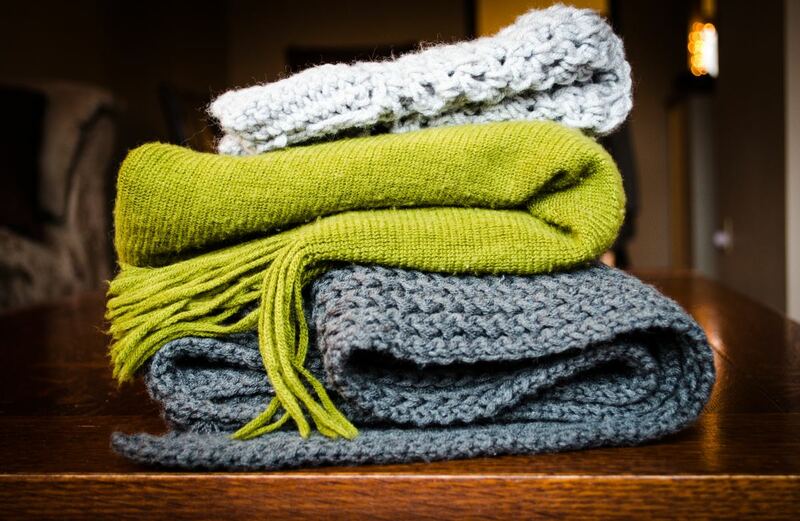 You can knit two of them, with or without the picot edging, and sew them together (back-to-back) to cover a round pillow. Knit in cotton yarn and follow the pattern to round 22 to create a special round dishcloth or washcloth. You can use a basic bind off or add the picot edging to finish off this cloth. © 2015 Donna Herron. No part of this pattern may be copied or reproduced in any way without permission from the author/designer. For personal use only. This pattern and materials made from this pattern are not meant for commercial sale. Hi Patricia - Knitting is easy to learn and I think you'd really enjoy it! How to learn really depends on whether you'd prefer to learn in person, or by reading books or watching videos. If you'd prefer to have someone show you the steps in person, you might want to check your local library or craft store (like AC Moore) for knitting classes. Local yarn stores also usually offer beginning classes. 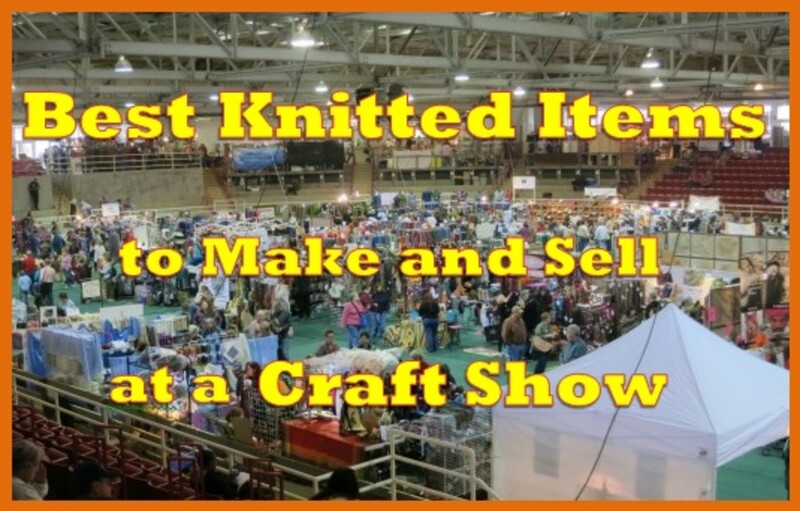 If you'd rather learn on your own, there are a number of beginning knitting books and lots of videos on YouTube. I hope this information helps. Good luck and thanks for your lovely comments. You are so sweet! Can I just gorgeous? And I would love to learn. I need to find out the most basic lessons so that I can possibly one day make something like the one displayed here. How to find out where to learn...that is the question? Do you have any basic for the one who knows not one thing about how to knit lessons I could follow? 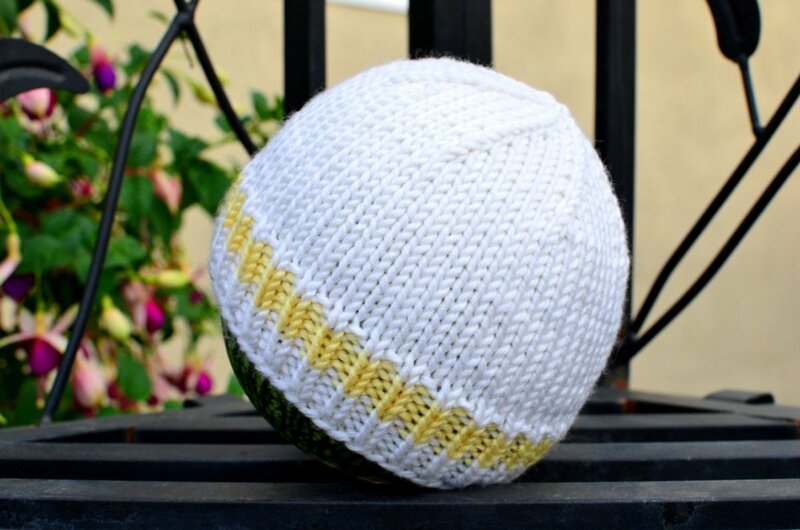 Hi Best of Aying - I'm glad you like this knitting pattern. Thanks so much for reading and commenting! Hi Patricia - Knitting is easy to learn, usually with just a basic demonstration of the technique. Most local yarn stores will show you the basics, or have set times where they will work with beginners. A lot of libraries also have knitting groups where you can learn. YouTube is a good source of tutorials and is full of videos for every and all knitting techniques. 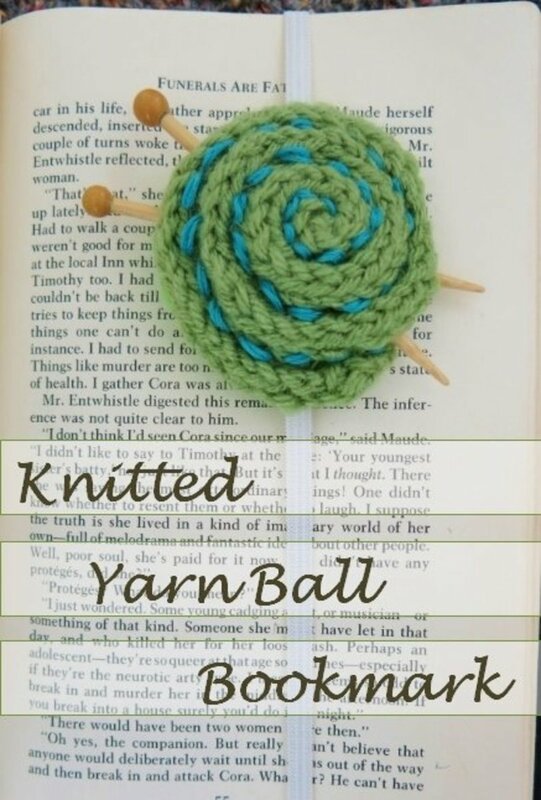 One of my other favorite knitting resources is knittinghelp.com. This site has a lot of good video tutorials and instruction. I hope these resources help you get started again with knitting. Thanks so much for stopping by and commenting! Best wishes to you! Hi Heidi - I'm very excited to have this Christmas tree to display this year. It's perfect for holiday decorating. Thanks so much for your comments and share! Best wishes to you for the holiday season! Hi Sally - Thanks for stopping by. 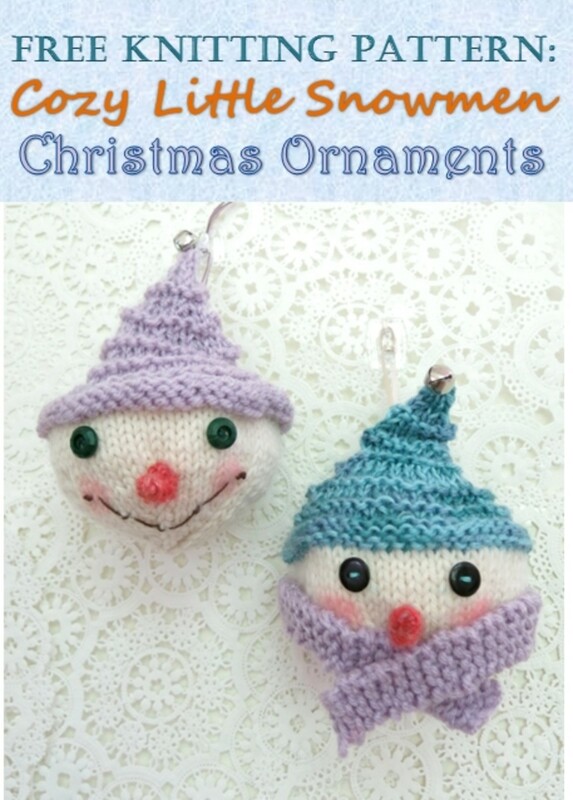 I wanted to get this pattern up in time for knitters to make it for the holidays. So glad you like it! Thanks so much for your comments. I appreciate it! Wow, this is amazing, Don! 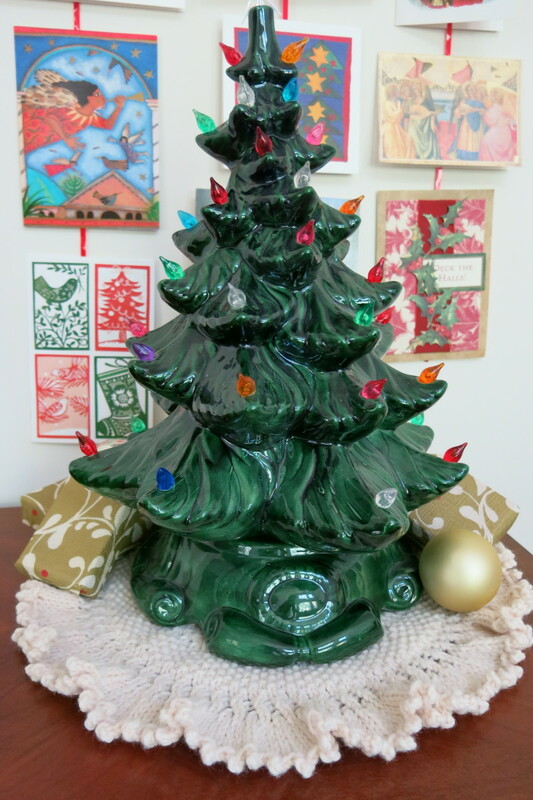 Years ago, a friend of mine hand made one of those ceramic Christmas trees that you so in the photos. 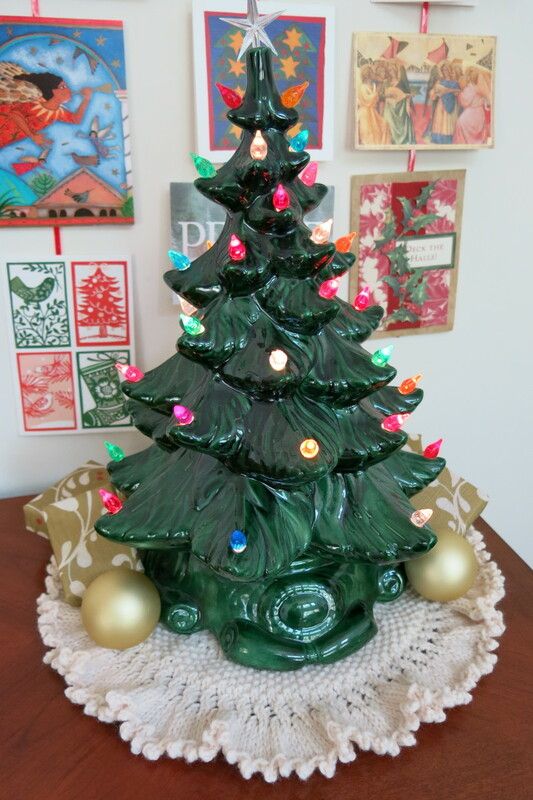 Now I'll have to make a beautiful tree skirt like this to display it. Lovely! Sharing! My but you have been a busy lady lately and this one is such opportune Hub with Christmas just around the corner. I am afraid crochet is way beyond my capabilities so I am happy to leave it up to you. Great images and clear instructions as always. Well done.